Earlier this week, I wrote about my first hour playing Girls RPG: Cinderellife. For a laugh, I poked and prodded the game, pointing out its less-than-inspiring portrayal of women—though this is nothing new when it comes to games or any other popular media really. Most of the things I poked fun at were a direct result of the setting: a Japanese hostess club. Personally, I find the idea of an RPG for women romanticizing life in a hostess club hilarious in its absurdity—somewhere between a game romanticizing the life of a bar waitress and that of a stripper. But gaming has always been about doing things you can't do in the real world, whether that be storming Omaha Beach or stopping an evil wizard from destroying the world. There is nothing wrong with hostess clubs being in games. Games have used them in various different ways in the past. 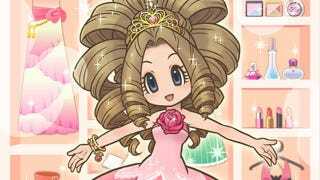 In fact, Girl's RPG Cinderellife's evolved from a cell phone game named Kyabajoppi where you manage a hostess club that catered to famous anime characters. It's a fun and silly idea, and one that Cinderellife continues to embrace—just with the framing device slightly altered. No, my problem is not with Cinderellife as a game or even a concept. My problem is with the chosen target demographic. While Cero (the Japanese equivalent of the ESRB) gave the game a C rating (ages 15+), Cinderellife is clearly a game that was designed for children. Young children, in fact. Not only is the game pink, sparkly, and happy to the extreme, the title of the game starts with the words "Girl's RPG'—something Level-5 was quick to promote at last year's Tokyo Game Show. But really the most telling evidence of a young target audience is the inclusion of "furigana." For those who don't know, Japanese has two 46-letter phonetic alphabets and a third alphabet of Chinese characters which has literally thousands of letters. Because children don't learn a substantial amount of these Chinese characters until they enter middle school, books, manga, and games targeted at children include phonetic readings above each Chinese character. This is called "furigana." In Cinderellife all Chinese characters, even the simplest ones, have furigana, making it playable by all ages. Being a hostess is hardly a job you want a young girl dreaming about, especially if she grows up believing it's the best way to find her prince charming. When I interviewed former hostess Elizabeth, we talked a bit about Cinderellife. And what she said sums up my own feelings quite adequately: "Honestly, inside you're slowly killing yourself. You have to drink large quantities of alcohol every night. And to top it off, you have to deal with customers who can be very stressful, bossy, demeaning, perverted. I don't think that this should be aimed at kids. This is not a lifestyle that should be glamorized in their eyes."